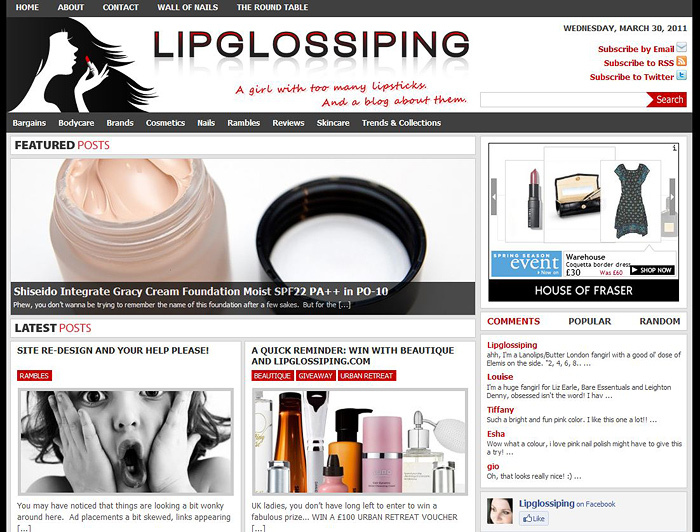 Welcome to the new look Lipglossiping.com – I had a mini heart attack when I flicked over to the new design. Properly too, my fingers tingled as I got flashbacks from Christmas! Thankfully, everything still seems to be in place with no major casualties (apart from my blogroll which I’ll update next week). I do hope you like it and I’m sure it will take a bit of getting used to… it’s a completely new navigation system but you should get enough of an idea from the front page as to whether or not the featured posts hold any interest for you before clicking through to read them in full. Plus, you get the tabs over on the right to browse through some of my most popular posts, play russian roulette with a random pick and see who’s commenting on what! Other features include tags and categories that are much clearer to read and easier to access whatever it might be that you’re looking for! *deep breath* go on, let me have it… do you hate it? WOOP WOOP!!! Love the site!!!!!!!!!!!!!!!!! I do like how neat the site looks now, and that it looks very sleek. The previous theme was more personal and this looks more pro – both are good things Will take a while to get used to, but its so much easier to find things now! I like it! Very professional and shiny looking!! Congrats! I agree with Paris B re: personal vs pro. In some ways I’m going to miss the simplicity of the old design but this is a super sleek looking website! love it much more now! congratulation on the oh-so-shiny new site! love it! i agree that the design looks more professional. Love it! I would personally gravitate to the old one, but that’s just because I’m a boring old minimalist 😛 The new layout is absolutely fantastic, though – it’s so chic and easy to use. Oh and also: I ADORE THE HEADER (too)! I absolutely love the new lay out! Umm. I’ll come back and take some time to comment. Site looks very posh indeed.. Sorry but it looks TOO pro for me. I really don’t like all the ads. Jo says above she can’t relate to it as well and that expresses just how I feel too. I like the new design. It looks a little too busy at first, but it also looks much more professional. However I still will be checking daily as long as I can, Charlotte, congratulations. I really do miss the old layout, I’m sorry. A bit ‘busy’ but loving the new layout overall!! Well done!! And LOVE the blog banner! What a clever idea!! OMG what have you done? you’ve totally killed a perfect blog and changed it into something tacky which looks the same as any other beauty blog and no longer anything special. would honestly put me off checking everyday.. I really don’t want to be negative as I love you and your blog but I much preferred the old design. This feels too busy and corporate/professional. I have noticed a few bloggers changing to this type of design and it does put me off. As I said before I do love your blog so will keep coming back, it’s just going to take some getting used to. It also isn’t as discreet to look at at work ha ha! I guess I’m just sentimental … I loved the old layout because it was so personal and difficult to navigate. It made me so happy to click through the archives! This layout feels so corporate and ‘busy’ – maybe it’s the colours and the busybusybusy tables going on. It utilises space really well of course, but I’d prefer if the home page had a running log of your posts like a ‘traditional’ blog instead of having to click through to individual entries. Jasmine yanked the words and proper sentiments right out of my head…I agree. I agree (although I didn’t *love* it because it was difficult to navigate, more that it was more personal.) I agree that this layout feels more corporate & busy though. & the ads are really bang-pow-there. I preferred the white background, lipstick logo & vertical rolling blog style too. But then again, that’s my preference/reason I liked it, not yours. So I’m happy you’ve changed it to suit you & can appreciate how much hard work went into it! It’s VERY different but I like it for the most part. We’re all creatures of habit and we all got used to the old site when we came here 4 times a day to see what’s what (Don’t try denying, people!) I really miss the old logo. It DOES look very professional and I think the comment boxes look nicer. I’m not too sure I like the black background, but I’ll get used to it. The main thing is, we’re still getting all that goooood sh*t, just presented in a slightly different way. Just keep doing what you do. The little stunner applying lipstick is a nice touch. HAVE YOU ALL GONE MAD I TOTALLY LOVE IT! I think the reason some people think the old site was more personal is because that’s what we have all been reading ever since you started, the look and feel of the old basic white website was what we associated with you. If you look at it rationally the new website has far more personally injected into it, its just a case of getting used to it. Looking down the comments most agree it looks more professional, the layout is better, and its a lot easier to navigate… these can only be a good things surely?! Tried to comment earlier but think it got chewed by blog gremlins. Well done Charlotte – it looks terrific. I know how hard it is to get a redesign done when getting content up daily is so time consuming all on its own. Gals, to those who aren’t keen on it, just give it time, it’ll soon be the most normal thing ever for you, and if I may, a gentle reminder: Charlotte does all of this for free. It doesn’t cost you a penny to visit her site and access her excellent content and images so try and keep that in mind. It can be very disheartening otherwise. The new design is wonderful! It looks so professional and sleek. And it’s easier to navigate too. Your new layout reminds me of a fabulous, value-added newspaper! I’m sorry, but I prefer the old website. I think that a middle way is better, but this is my opinion and you like it so this is important. This is not a revamp, this is a Marks and Spencers revamp ^_^ So much has changed, what a shock to the system. Let’s start with the positives: I didn’t have any problems with the navigation on the old website and I could find whatever I want on it, but this new improved navigation system is FABULOUS. I love being able to have easier access to the recent posts, to the most popular posts. However I am not a fan of the layout. I apologise in advance if this sounds like a party pooper to reuse one of the expressions used by another comment and if my immediate reactions are too honest and brutal. Now as if it the red was not powerful, we seem to have 3 lots of adverts which somehow I didn’t notice before. And then, like 3 ads flashing at my eyes was not enough, we have the ‘featured post’ snazzy gadjet to flash even more. Too much red, too many boxes, too many things highlighted, too many borders, too tably and too many pictures everywhere. The recent post features is a good idea, but added with the featured gaget, it is almost like visual overdose. Why is everything in boxes? do we need borders between the facebook box and the google connect box for example? Before it would flow so easily. Your site was one of the breeziest, calming and the advertisement was so discrete before. I really miss the old website. I will still read your blog everyday but I really miss the lipglossiping first generation, the one I discovered and the one I spent 2 hours on it the first I discovered it. And now I wish I had kept some memorabilia from it. There are too many changes in one go to digest in one lump: the layout for starters, probably the biggest chunk of them all, but did the picture logo, the title logo, (even the favicon) had to change to. This is like coca cola changing font overnight and expecting to go along with it without shedding tears. 1. The WEBSITE (just the platform onto which your blog is on) has totally lost its identity. Your blog never suffered before from looking amateur and always professional, but now it’s just gone a bit overboard with a layout which is a bit too journalistic. Even the current date is written on now. And then in the middle of this formal newspaper style, we have the lucida handwriting font for your subtitle? 2. The BLOG however hasn’t lost its identity and I will come back with pleasure to read cos essentially it has kept the elements of why lipglossiping.com is so good and of what makes lipglossiping so good in my mind: the quality of the content of the posts, the unique style of writing, the humour, the outstanding photography to list just a few of my favourite reasons of why i love your blog so much. i like the new new design, and I understand what you were saying about the white vs black backround. but you were one of the first to have a fresh looking blog. I prefer if you use white on the black, rather than black, it kind of matched the quality of your photos too. A fresh and airy kinda feel. I know I’ve already commented saying I love the site, but I wanted to comment again…about the other comments. I’m really quite surprised at how many people feel a kind of ownership over this site and seem quite annoyed that your new design isn’t to their tastes. Of course your readership is hugely important but ultimately this is your site, your content and your design – if you like it and you’re happy with it, that’s the most crucial thing. I have no problem with the professional look – this is a professional blog in my eyes in terms of your reach and influence amongst the blogging community. You’re one of the bigger big guns, and there’s absolutely nothing wrong with your site reflecting that. As I said earlier, I think the site looks amazing. You and Mr L should be enormously proud of it and have faith that you will retain your readers because of your peerless photography and writing skillz because let’s face it, that’s what we’re all here for after all. Ooh a new design. I applaud you for trying something so different from before and the sheer amount of hard work that goes into building a template like this – a working one – is vast and should be acknowledged (well done Clive). It takes time to adjust to anything – like can you believe this country is actually run by Tories? – but I like the new look site, it’s very slick indeed. It’ll take a bit of getting used to but cos you post so much, it will make it easier in the long term to flick through the last few days’posts. You’re not the first and you won’t be the last big blogger to do a radical template change, and it’s tricky but the magic of your blog is in the content and of course the photography as opposed to just the vehicle it’s presented on. I am sure that everyone will adjust. Love this new look. It has a nice magazine-y feel and navigation is great.